Web traffic - the holy grail of modern business and essential for office products resellers and e-commerce strategies. However, the thing is with developing sustainable relevant traffic is that it’s hard work, likely to take a long time and involves the use of both science and art. Figure it out and build enterprise value or, sit back do nothing and watch competition eat your lunch! Ten years ago, early adopters with deep pockets funded their traffic development with expensive paid-search strategies and then used their savvy to convert first-time “paid” visitors to repeat customers through email marketing, special offers and other loyalty programs thereby avoiding payments to search engines, such as Google, for subsequent visits. As a result they were able to gradually reduce the percentage of paid visits as a portion of total visits to their sites. As these events played out and the Google search algorithms continued to evolve it became clear that high quality content was to become a much more important factor in order to be rewarded with higher placements in search results. Companies with older “birth” dates for their web properties, high quality content, large numbers of external links and favorable KPIs on key web statistics such as traffic volume, time spent on page and bounce rates, etc. were rewarded with higher rankings in terms of domain authority and “trust” as measured by SeoMoz. The higher the domain authority then the higher a site places in popular keyword searches. For example, on a scale of 100 the domain authority for DepotMax is around 85 and for a typical small regional office products dealer it’s 12. The problem for a small business trying to develop traffic with a paid search campaign around a high competition keyword such as “toner” is that they will never appear high in search results because their poor domain authority compared to larger companies ranks them much lower in the results. In total there are as many as 150,000 searches per month for high competition key words closely related to “toner”. However for the reasons explained above, none of these will work for a small business with weak domain authority attempting to launch a Google Keyword strategy. 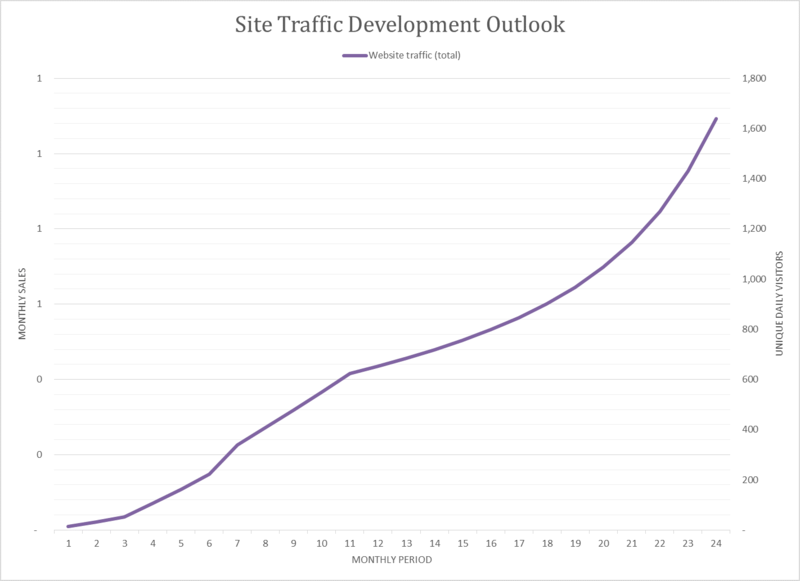 While there may still be a place for paid search as a component of a traffic development strategy, for a small business to attempt to replicate the strategies of early adopters would most likely fail. Instead small enterprises should consider what’s called “long-tail” keyword searches. For example, using a string of key words such as “Nashville Office Supplies” there are only 10 monthly searches and 400 or so related searches as a result of including the word “Nashville”. By including these long-tail keywords in blogs and websites and then conducting a paid keyword campaign it’s likely to result in high placings albeit on a vastly reduced number of searches. Given the limitations and expense of a keyword paid search strategy it’s necessary to complement any paid search strategy with an initiative for developing qualified organic traffic. In order to do so the following approach or a variation thereof will be required. Content - the search engines reward high quality, unique content. However, in order to be rewarded for content, not only does it need to be unique, it needs to be useful. Creating high quality content for which there’s no audience is a waste of time. So, if a business operates in a large market it has to figure out what the key issues in the industry are and whether or not it can help solve some of those problems with information it can prepare and publish on its website and other relevant online platforms. Let’s assume a small business takes the time to create content that addresses key issues in the vertical it operates in and also takes the time to have its website optimized for the keywords and designed with an appealing “look and feel” that immediately puts his business in a favorable light for visitors. Publication of content and fighting for attention - it’s necessary to determine the social media strategy. For this post LinkedIn, Twitter, Facebook and a company blog will be used as examples. 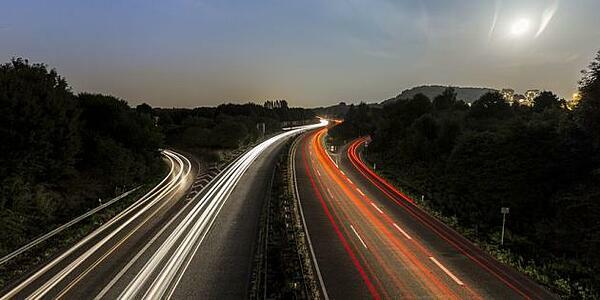 There are of course others and some of those may well be appropriate for certain businesses but, outlining a strategy for the four selected here should be sufficient for the purposes of explaining how social media must be a key part of a traffic development strategy. The primary goal for a small business should be to demonstrate its authority and expertise in its market and for its products, to expand its audience for these areas of expertise and to promote its trustworthiness as a supplier. We have already talked about content and, in order for it to be useful, it has to demonstrate expertise and provide solutions for problems within the market the business operates. Once content has been created then, it should be clear, the next step is to deliver that content to as wide an audience as possible and social media is the platform to accomplish that goal. But, as with everything else, it takes commitment, consistency and hard work to building and developing high quality networks. 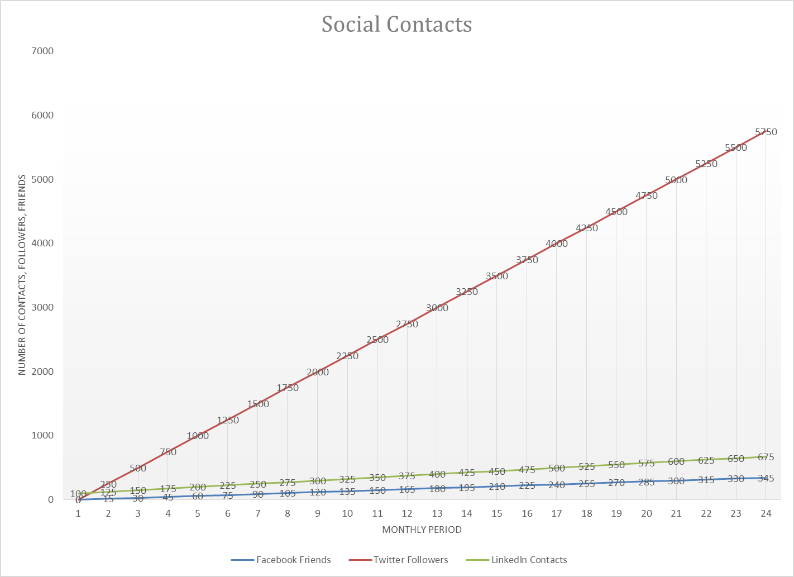 The chart above displays a model showing steady growth in the three networks over a two-year time frame by adding 25 LinkedIn connections per month, 15 Facebook Friends and 250 Twitter followers. Assuming a starting point of zero on Twitter and Facebook and 100 on LinkedIn then the network can be grown to nearly 7,000 within a two-year period. The higher the quality and relevance of the connections to the market of the network builder, then the greater the value of the network and the more likely it will be interested in the content being distributed. Never be tempted to shortcut the network building process – don’t be tempted to purchase Twitter followers or Facebook likes – there’s little chance these are going to be interested in anything you have to say. Next it’s necessary to work to a consistent schedule for publishing new content which, by now should go without saying, needs to be high quality, interesting and relevant. It’s OK to curate third party content and to redistribute material interesting and relevant to the audience but, there’s no getting around that original content is also required. This should be prepared and published via a suitable blogging platform and the larger the publishers network the larger the audience for the material. Techniques for converting readers into leads via visits to the website need to be learned and deployed as this becomes the foundation for developing qualified inbound organic site traffic. In addition to blogging and publishing material to the social media platforms, each business operator should commence a direct email campaign by way of a newsletter on a weekly or twice weekly basis. The newsletter also needs to be designed to attract traffic back to the website with various “calls-to-action” in each blast. Consistently publishing new and relevant material will help to ensure the audience expands and remains interested. These are the key components required to initiate a successful strategy for increasing relevant organic inbound web traffic the results of which are demonstrated in the chart below where the model shows unique daily visitors increase from a starting point of 15 to over 1,600 per day within a two-year time frame. There are no overnight success stories for developing qualified web traffic. Many small businesses start out with good intentions but, because results don't take place overnight, they give up. We can't stress enough how important it's to stay motivated, stay the course, and not forget this is a one to two year project to get started. If a company has the staying power to see this through then through strategic use of social media, blogging, and email marketing it will eventually accomplish a business transformation. A cool tool to help with motivation and for observing daily results of activity and progress is enabled by linking social media accounts with Klout. This free service generates a daily score that’s displayed alongside the Twitter handle that the owner, and all other Twitter users linked with Klout, can see. The scoring scale is 0-100 with Google being an example of an enterprise with a score of 100. A new registrant is likely to see an initial score somewhere between 10 and 20. The higher the score the harder it is to get to the next level but, so long as the network is expanding and interesting content is being published, progress will quickly be seen which can act as a strong motivator for continued efforts as well as being a recognition of authority visible to peers. We'll publish more material on techniques for web traffic development in future blogs but for a comprehensive overview of the office supplies industry and the role the independent reseller can play, please download our free e-Book by clicking on the link below. Or follow this link to our white paper for everything Office Products & Business Equipment resellers must know to attempt, and survive a digital business transformation.